I hope this book covers the problem areas in your Kiev. I think you'll find when your Kiev works the way it should, it is a wonderful camera to use at a fraction of the price of many other 6X6 slr's. Enjoy!!! First off you are going to need to get inside your Kiev. Lay out the hand towel and place your Kiev on it. Now you're ready to work! Here you will find three more screws , these will need to be removed also. Under the dial guide there is yet another small guide. 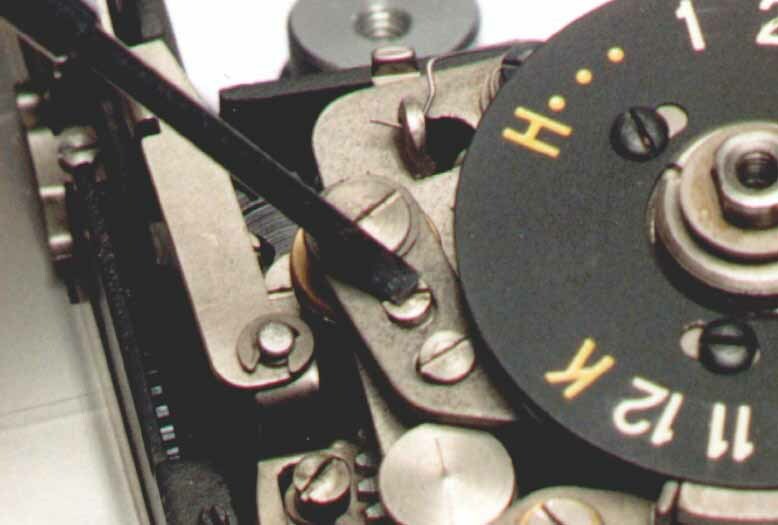 If it doesn't come out when you remove the first guide, leave it in (this is what the dial is screwed into). Now on to the advance lever. The next step is to remove the advance lever screw. 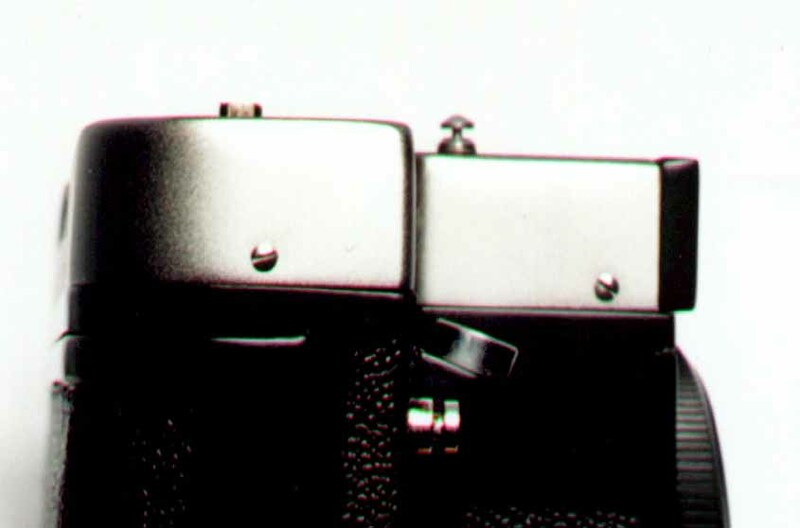 For this you'll definitely need that pair of pliers. Turn the screw counter-clockwise and lift off the advance lever. 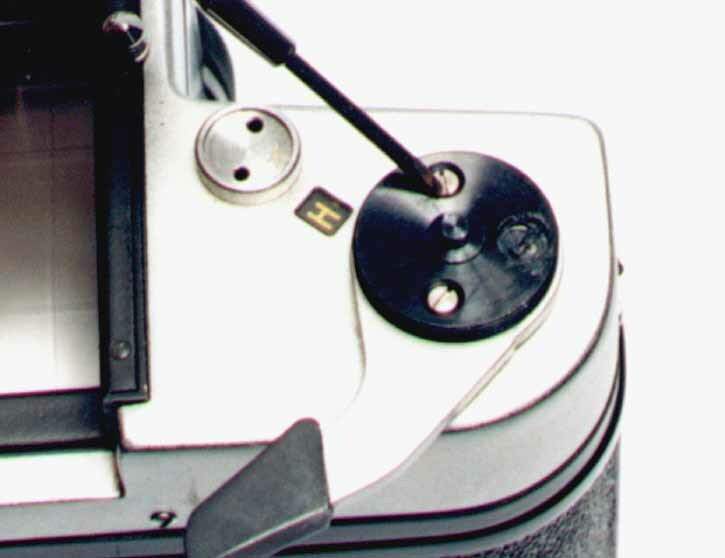 Under the advance lever is yet even more washers and the lever guide. Take these off too.Now it's time to take of the top cover. Now lets take a look inside!!! Have you ever wondered why some of your negatives (or slides) come back from the photo lab out of focus when you use your Kiev? When I got my first Kiev I did. At first I thought it was my eyes but all my 35mm shots were fine. Being familiar with large format photography and the use of ground glass as a method of focusing a camera, I made a makeshift ground glass insert for my Kiev. I focused the Kiev opened the back and fired the shutter. Man was I surprised how off it was. 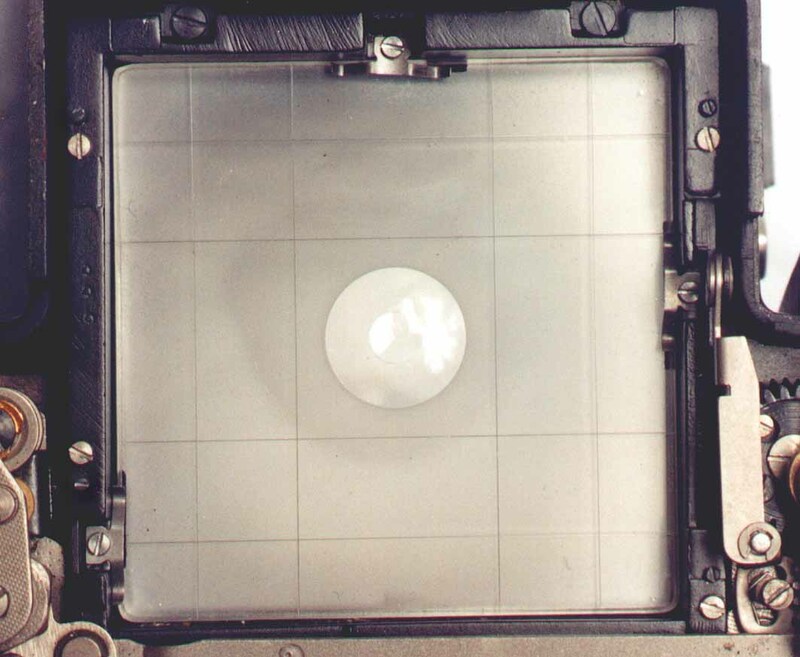 Having worked on older 35mm slr's, I had a good idea of how to get inside my then new Kiev. Well, now that I've droned on long enough, on to the real reason your here. 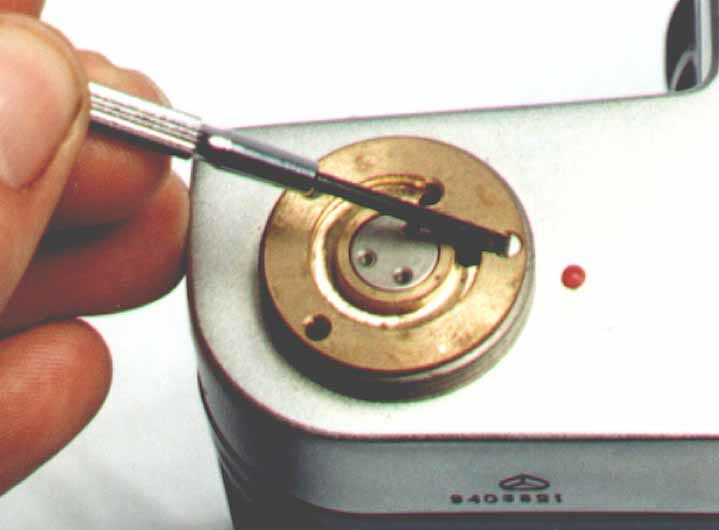 Loosen the locking screws. Starting with the top left adjusting screw, turn the screw (try one way then try other) until the upper left corner of the focus screen is in focus. Repeat these steps with the three other screws. 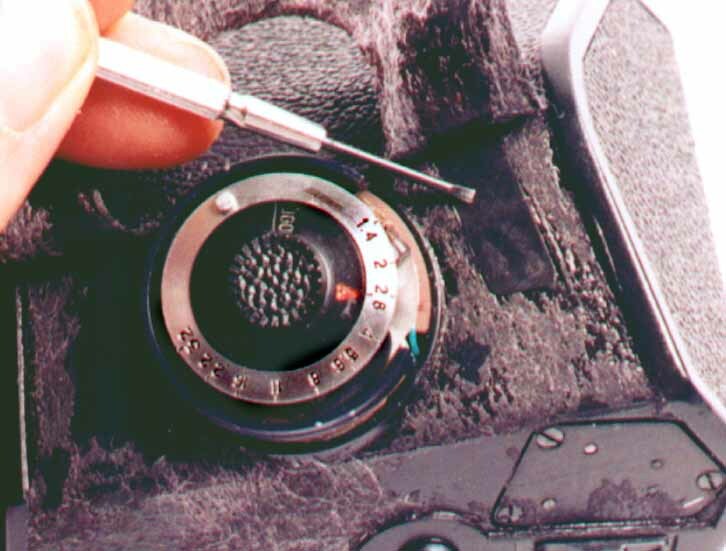 Check the focus screen with the loupe and repeat the steps if needed. Frame spacing is a big problem on Kiev's. Some of us get that famous extra shot/frame kiss on our rolls. Now I've read about all kinds of fixes like how you need to find film spools of this or that thickness. I'll be the first to admit it, I'm lazy. I don't want to mess with measuring all my film spools to see if they are the thickness some suggest or some other mundane task to get proper frame spacing. I just want to take pictures. That's why I'm going to show you how to adjust the Kiev 60's frame spacing the way it should have been done at the factory. 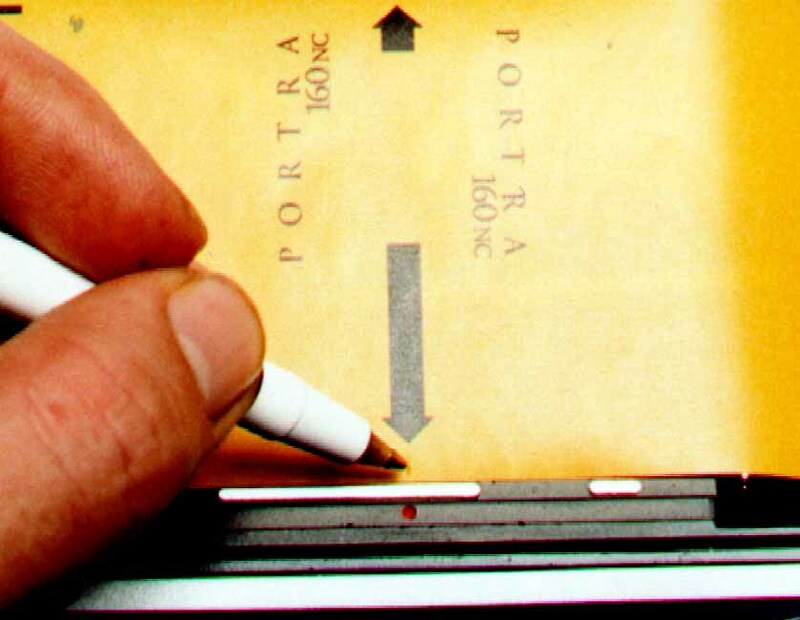 As you can see, the "1" in the middle of the backing paper isn't in the center of the shutter opening. This shows that the Kiev's frames will overlap (that's why you're here). 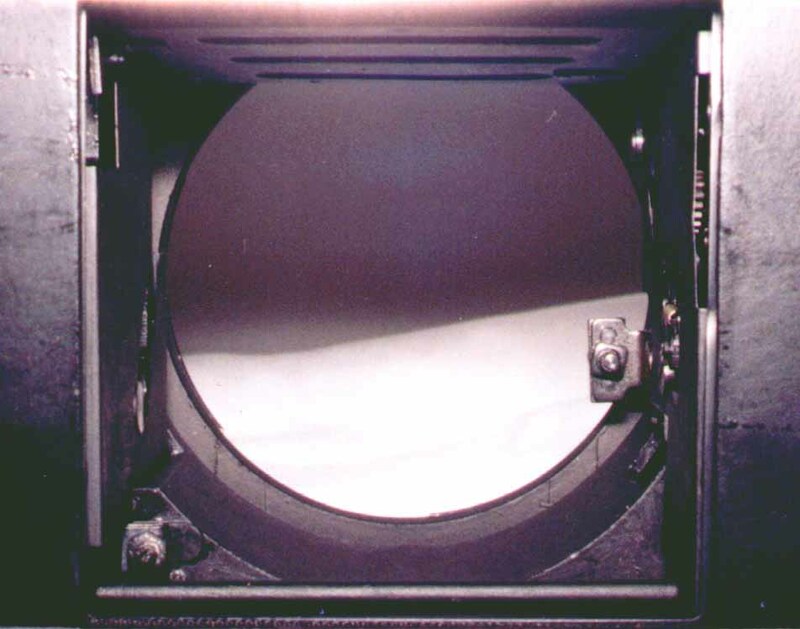 If your K60 advanced the paper with the "1" to the middle of the shutter opening (or even as far as the red dot) then you're done. 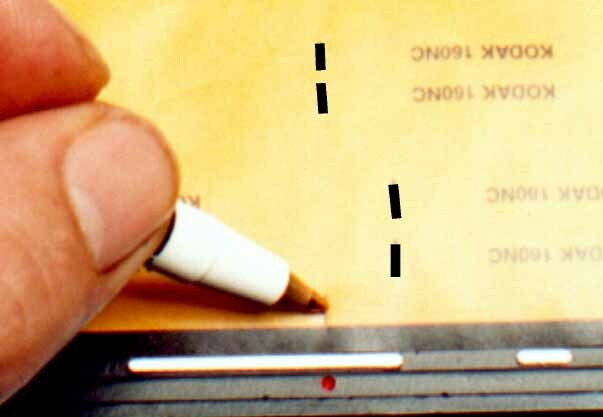 I personally suggest having the "1" in the middle of the paper line up with the red dot because if the "1" is lined up with the red dot you'll get close to 1/4 inch spacing between frames!!! 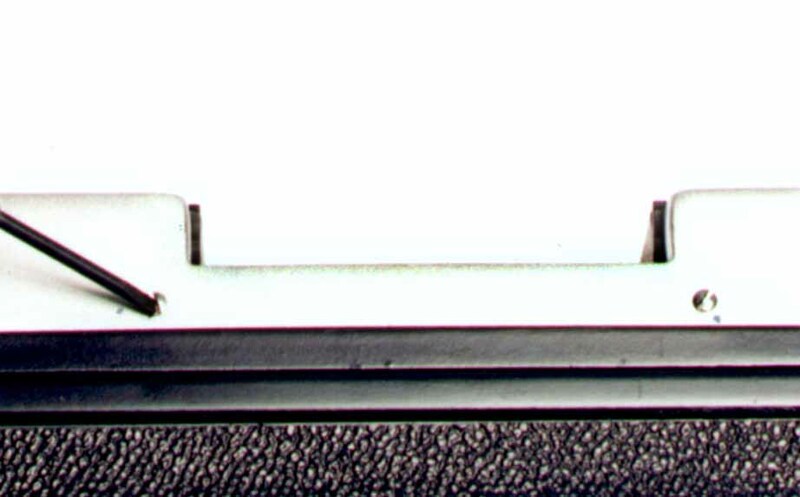 If your K60 didn't advance the paper far enough to place the "1" in the middle of the shutter opening or farther and advanced it shorter than your first reference mark then move the adjustment screw all the way to the back, respool and load the paper and advance the camera four times again.This time mark it with a "b". 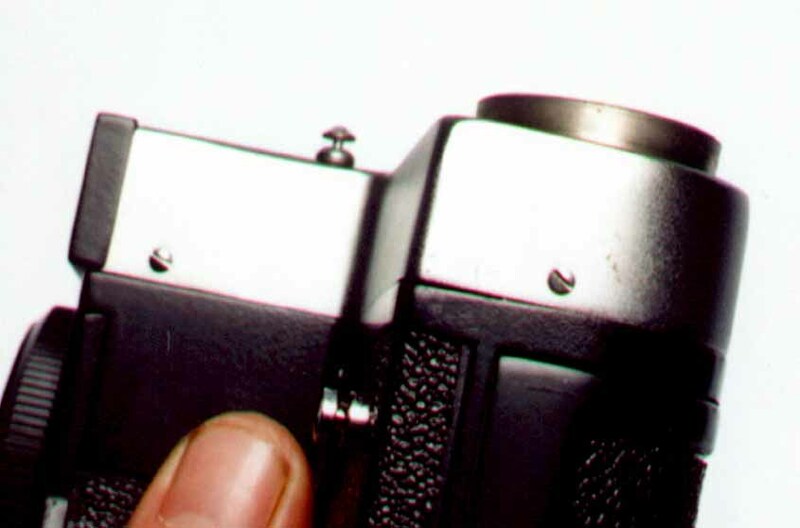 Check to see what direction the adjustment screw needs to be moved to increase the film advance. 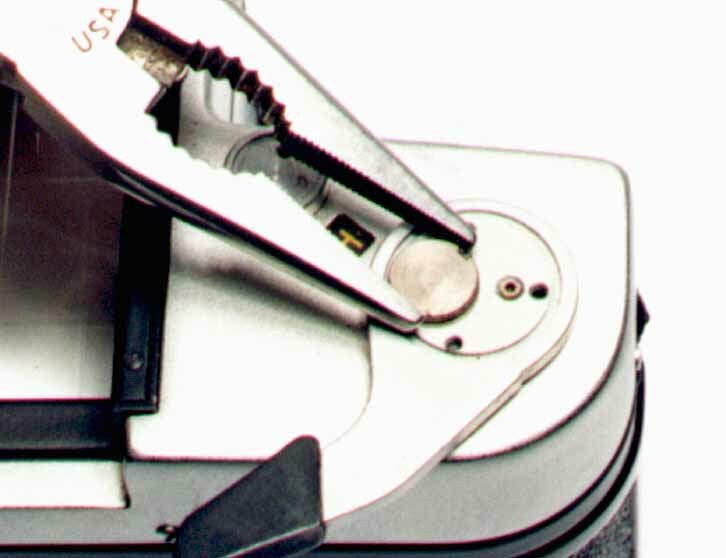 By moving the adjustment screw in small increments you can fine tune the film advance. *NOTE* If nomatter what adjustments you make you can't get the camera to advance the paper far enough to get the "1" in the middle of the shutter opening then I'm sorry to tell you that there are machining problems in your Kiev and may want to replace it. 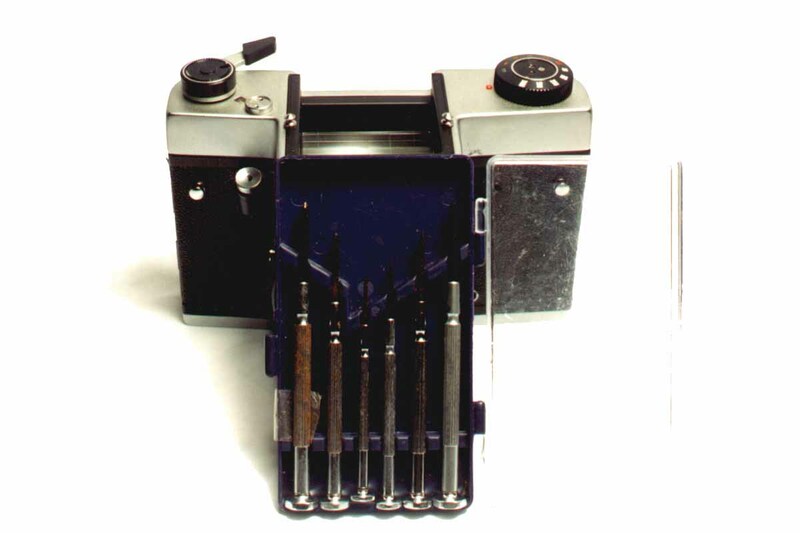 Now you are done with the adjustments needed on the top side of the K60 take off the advance lever and put your Kiev back together (don't worry about the leatherette, I'll cover that in section 6).Lets go to shutter speed calibration next. As if having an inaccurate meter wasn't bad enough, sometimes I've found bodies that the shutter speeds were off by as much as a stop. (Then again, I'm still using a '79 Salut-S that's consistently 1/2 stop slow as my studio camera, I guess the springs are shot but I can't bear to part with it.) I shoot slide film for almost everything and having accurate shutter speeds are a must. Well, lets get started. Adjuster 1 is for the first curtain and adjuster 2 is for the second curtain. The first curtain determines how fast you shutter opens and the second curtain determines how fast your shutter closes. Now follow the directions for the shutter speed tester on how to check your shutter speeds. Start with the 1/2 second setting and time the shutter speed three times. The times should be close to each other. Add the times together and divide the total by 3, this will give you the average shutter speed for the 1/2 second setting. Now do the same for the rest of the shutter speeds. Generally the higher settings (1/500th, 1/1000th) will be further off than the slow speeds, sometimes as much as a stop but this is rare. After getting an average shutter speed for all the settings, compare them to the speeds on the dial. If you are within 1/2 stop at all settings ( 1/3 to 1/4 stop for slide users) then I suggest leaving the speeds be. The shutters in almost all manual cameras are rarely dead on. *Note: In the case of increasing the curtain speed, don't turn the adjuster if the adjuster gives a lot of resistance. Doing so can damage the springs and ruin the shutter! 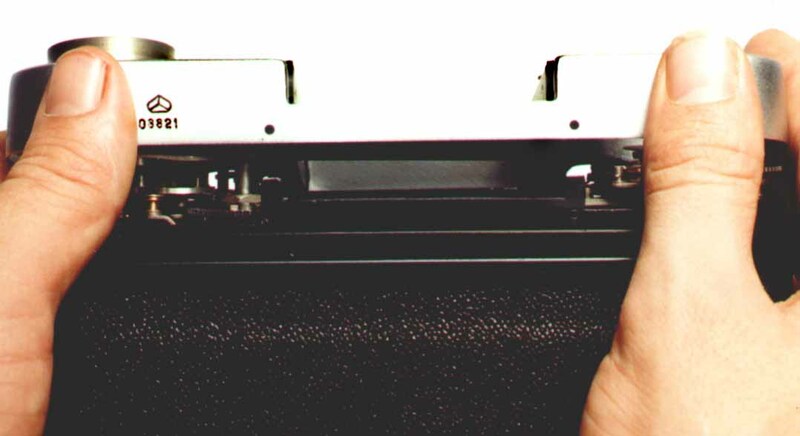 Also, sometimes the contacts are misaligned when they are manufactured. This will cause the second curtain to not sync properly with the flash and intrude on the shutter opening. This is a problem that requires a repair tech and is not covered in this book. Keep checking the second curtain till you no longer see it in the shutter opening during the exposure. Now check the first curtain using the method described above and adjust as needed. The adjustments for the first curtain are the same as the second curtain. You then need to disconnect the flash and check the 1/60th speed setting with the tester. 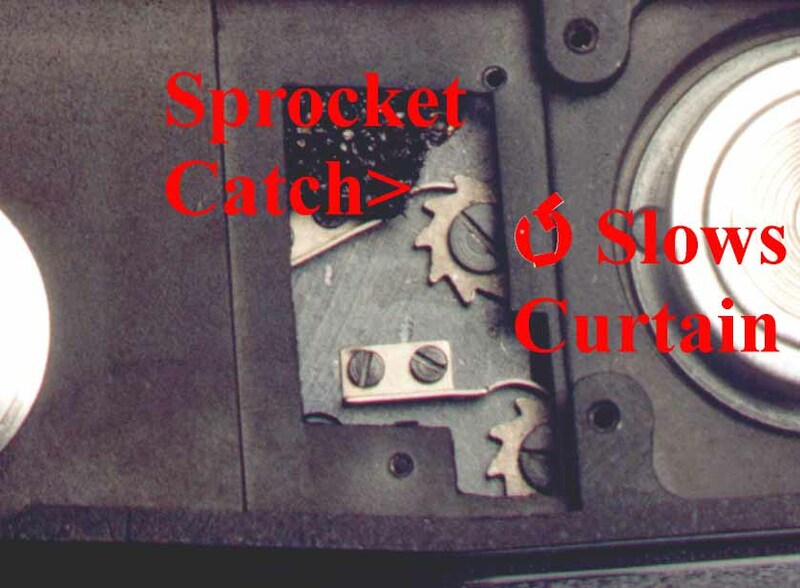 By checking shutter speeds and adjusting the first curtain you can fine tune the higher shutter speeds. Again, the faster the shutter speeds the less accurate it will be. Here is a list of recommended tolerances for shutter speeds. 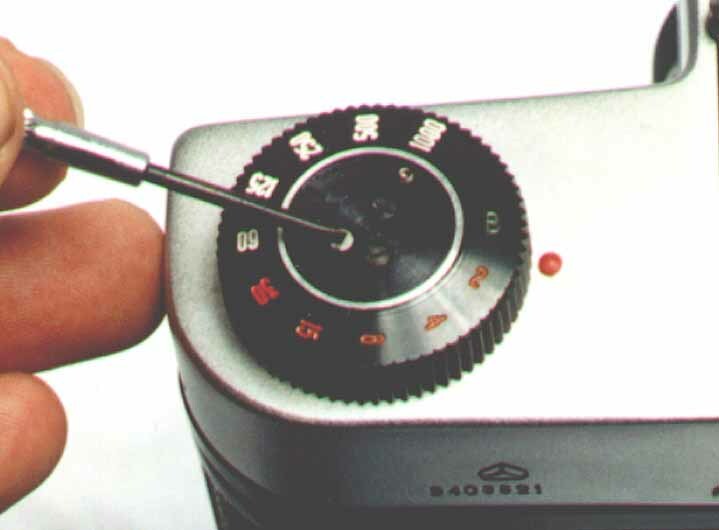 Once you are finished with adjusting the shutter put the bottom back on. 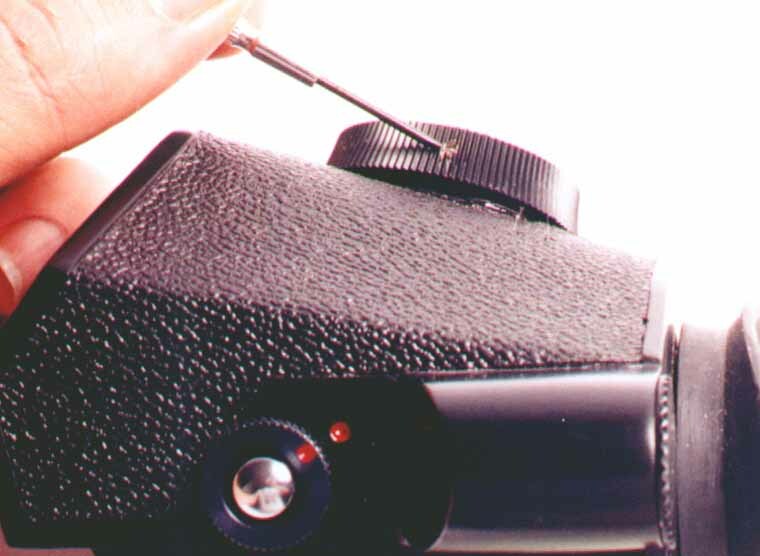 You will need to hold the camera back release button in place with a screwdriver while you put the bottom back on. Lets put your calibrated Kiev back together. Now that we have finished all the internal adjustments it's time to put your Kiev back together. Remove the advance lever and follow the disassembly instructions only backwards. For those of you that can read or talk backwards it will be a breeze. "But what about the leatherette" your thinking. Well you'll need to take some trim adhesive dip a modeling paint brush in it and lightly brush the underside of the leatherette. 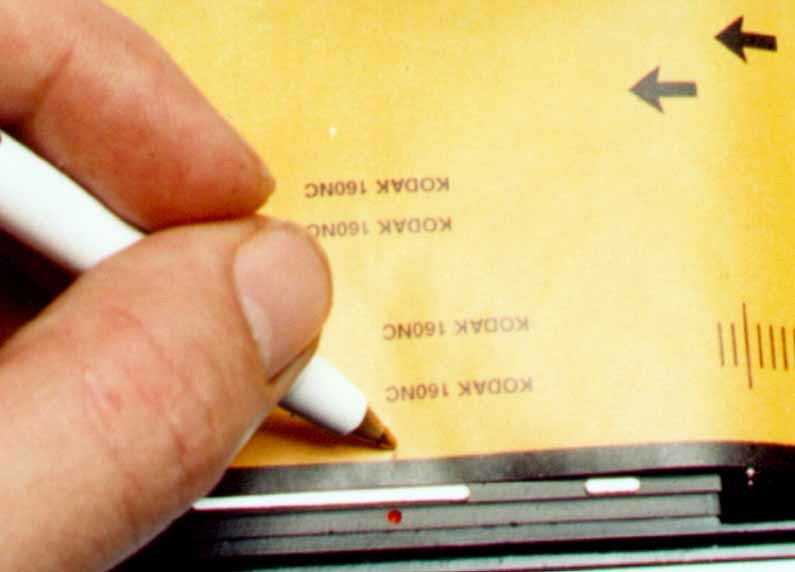 Be sure to follow the instructions for the adhesive because most adhesives require that you wait awhile before you actually glue anything back together. After the adhesive has had time to get sticky, put the leatherette back into place. Your Kiev will most likely need to set over night for the adhesive to "cure". After that's over we can move onto the next step, calibrating your meter. Most of us carry around a handheld meter when we use our Kiev's. It's not because we're "zonies" (people that zone meter EVERYTHING) it's because we have to. 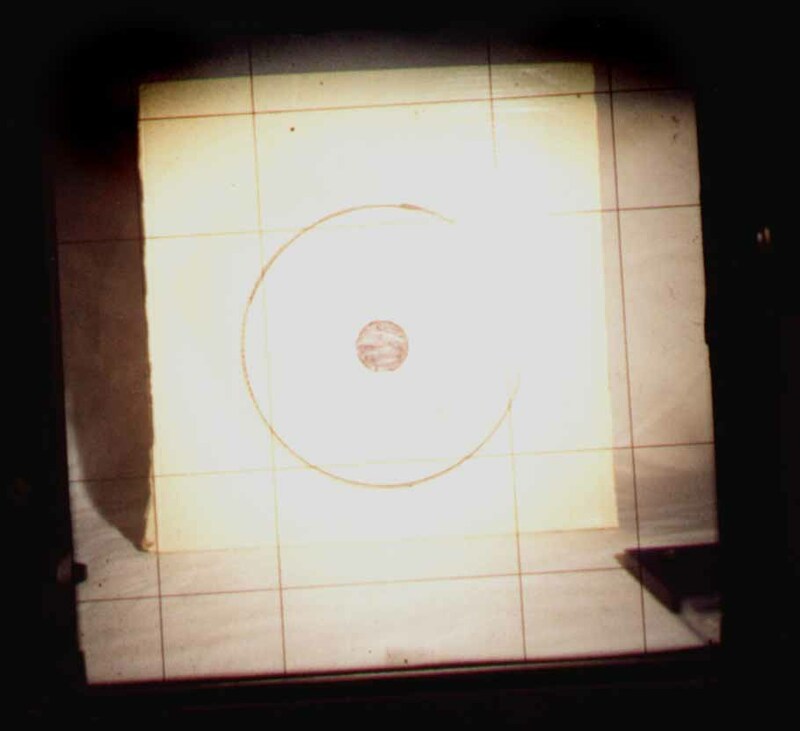 When we do calibrate our meter using the "sunny 16 at 100ISO and loosen dial" method we find that our meters are nonlinear. We end up getting under or over exposures depending on the lighting. So now we are back to square one and still need a handheld meter. I've heard that nobody can make a nonlinear meter meter properly. I think it's more like nobody wants to take the time and believe me it takes a lot of time. This method will calibrate the meter for readings of about 1/1000th @ f/11 down to about 1/4th @ f/2.8 at 100ISO and get the meter within about 1/2 stop over the entire range. This range of readings is one stop short of the entire range of the meter dial. I guess we should get started. 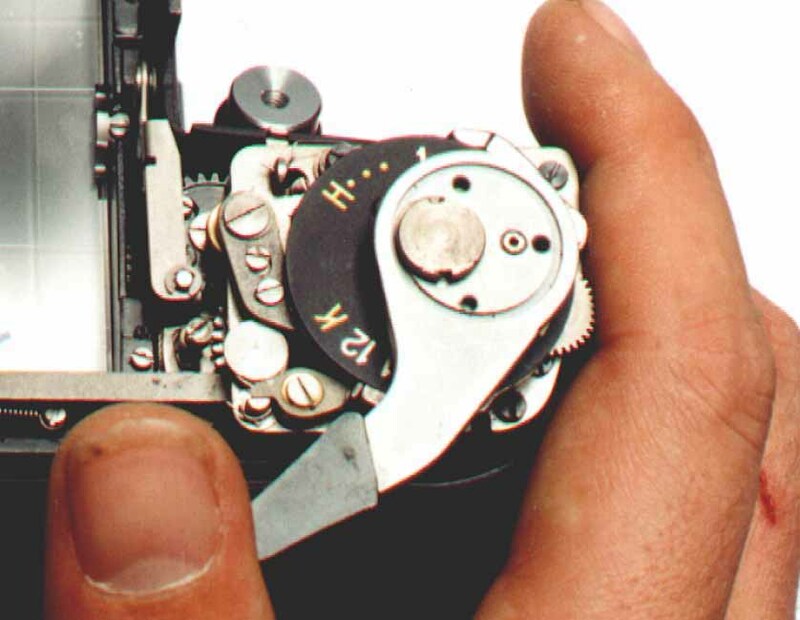 Inside you'll see two dials, the one closer to the top of the meter adjusts the meter's maximum light metering and the lower dial adjust the minimum light metering. Now reattach the meter dial making sure that it's set to 1/1000th @ f/11 at 100ISO. Turn the meter on and adjust the meter max adjuster till the exposure indicator in the meter gives you a proper exposure reading. Now using your reference meter move away from the light source till it reads 1/4th @ f/2.8 at 100ISO. 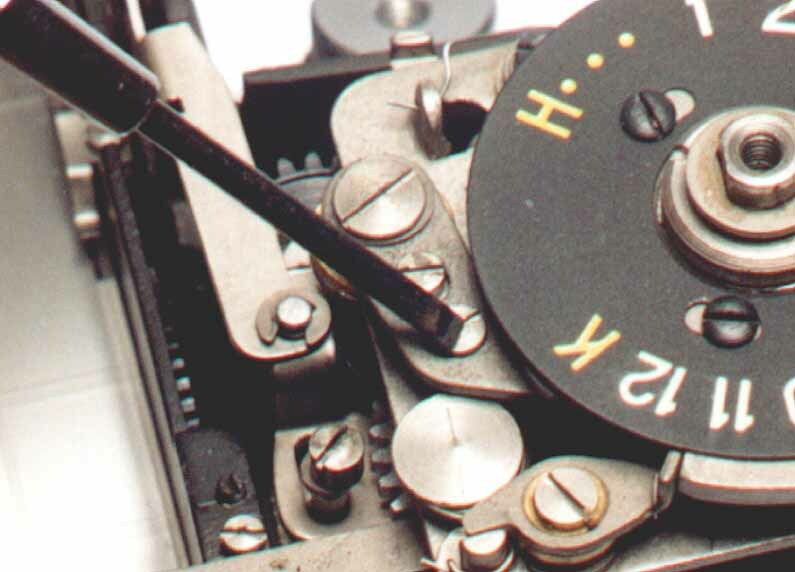 Move the K60 to the same distance and set the K60's meter to the same setting. Looking through the finder turn the meter on and turn the low end adjusting dial till the meter gives a proper exposure. If you are within 1/2 stop or less then don't bother to adjust the meter. As far as the lower readings, the meters I've worked on fall off rapidly after 1/4 @ f/2.8. Some not as bad as others but enough to be unreliable. 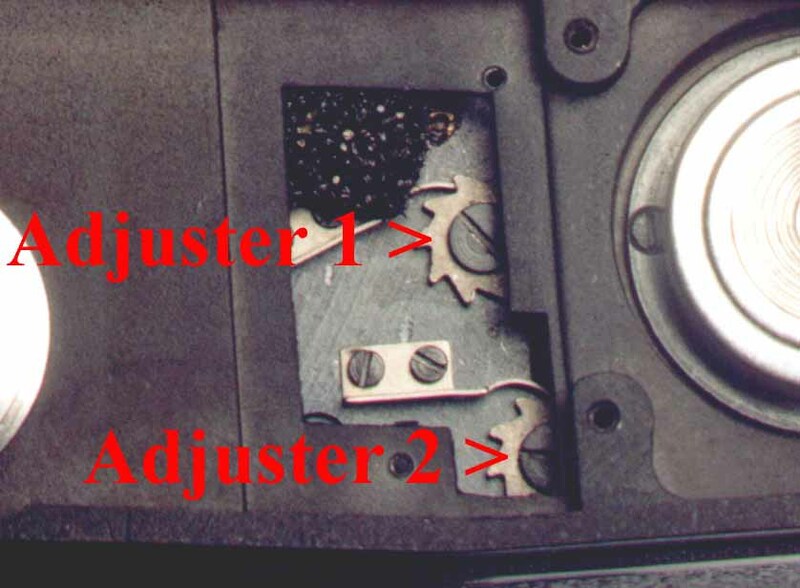 The upper and lower limits are limited by the adjuster dials and the accuracy of the CDS cells and circuitry. Having the meter copied with but better parts would probably produce better results but that's beyond my capabilities (or wallet if I had somebody else do it). I feel that the range of accurate readings that this method gives is good enough for most uses. *Note: Your results may vary from mine. You meter may only be within 1/2 stop down to 1/8th @ f/2.8, or it may be within a 1/2 stop at even lower readings. 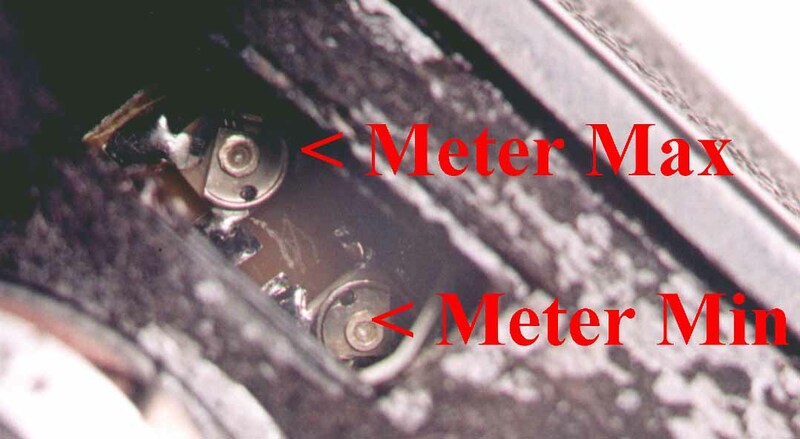 This is due a the lack of quality control and metering range as far as the meters electronics are concerned. Internal reflections are a big issue for K60's. You would think that the factory could have used something other than GLOSS black paint in the mirror box. I guess flat black paint is rare there or nobody really cared about it. In this section I'll describe the flocking method I use in my own Kievs. Ideally, optical flocking paint would used but for some it's near impossible to find. I'll give you a low cost but effective alternative to optical flocking paint. Here we go. Spray some paint into a cup. Paint the half of the panels, the mirror mount closest to the shutter opening and anything else that has the stock black paint. Be sure to not paint the pivot points of hinges or else those parts won't move freely after the paint dries. 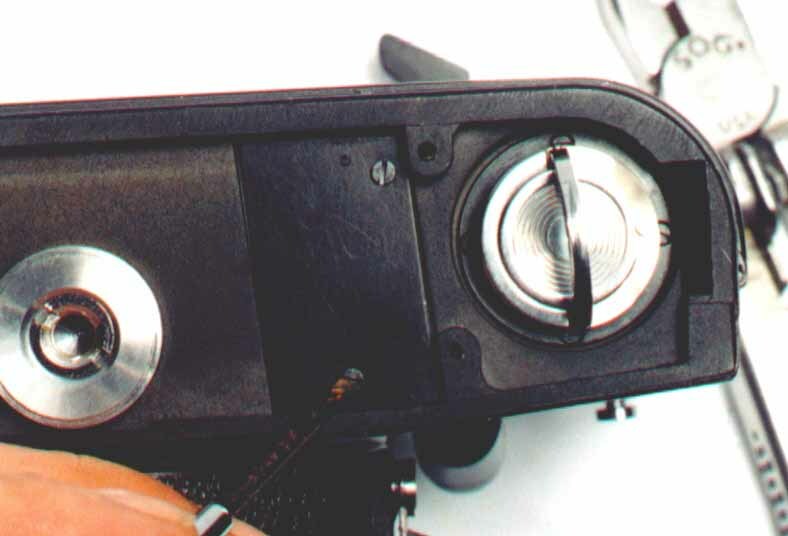 After you have done that, unlock the cable release and turn the camera around so the lens mount faces you. Paint the rest of the areas inside your K60, again making sure to not paint the pivot points. After you have painted these areas let the body sit overnight in a warm dry place to let the paint cure. The next day go back and touch up where needed. You now have a flocked and calibrated K60. Except for replacing a part here and there, you've just done the same thing (and more in regards to the meter) that some places (I won't mention names) charge $100 or more for. Even better is the fact that unless your K60 breaks you now know how to recalibrate it as the camera ages.